In a recent Progressive Voice column for ARLNow, our Executive Director Michelle Winters had the opportunity to weigh in on how we are doing two years after the Affordable Housing Master Plan was created. In the column, Michelle discusses the loss of critical market-rate affordable units, the worsening political environment, and the shortage of funding in the context of the Arlington housing market. Housing affordability concerns in Arlington have reached the point where households higher and higher on the income scale are affected. 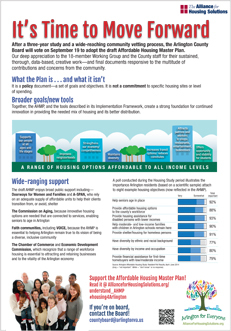 As Arlington's Affordable Housing Master Plan was approaching a vote by the County Board in fall of 2015, AHS reached out to its mailing list with a Q&A on the plan, urging support, links to key documents, and a call to action. AHS also ran two full-page ads (click on an image below for a larger view) in the Arlington Sun Gazette (September 10 and 17, 2015) to provide information to the larger Arlington community. The County Board adopted the AHMP after a September 19 hearing (more on that hearing, with link to video, here).